Hamas shut the crossing between the Gaza Strip and Israel on Sunday after blaming the Jewish state for the assassination of one of its officials in the Palestinian enclave. GAZA CITY: Hamas shut the crossing between the Gaza Strip and Israel on Sunday after blaming the Jewish state for the assassination of one of its officials in the Palestinian enclave. A statement from the interior ministry in Gaza, run by Islamist movement Hamas, said it was shutting the Erez crossing for an indefinite period as it investigates the murder on Friday. 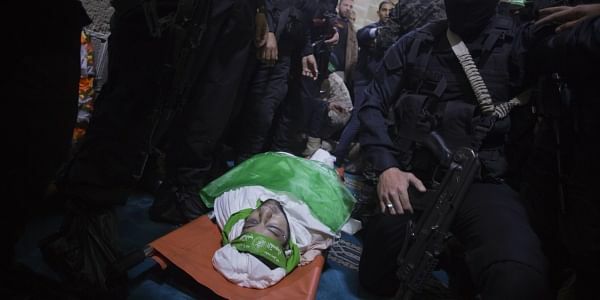 Hamas officials have blamed Israeli intelligence agency Mossad for the killing of Mazen Faqha, 38, who was shot dead by unknown gunmen in the Gaza Strip on Friday. According to Israeli media, Faqha was responsible for cells of Hamas's military wing, the Ezzedine al-Qassam Brigades, in the Israeli-occupied West Bank. Israel arrested Faqha and sentenced him to prison over suicide attacks that killed hundreds of Israelis during the second intifada, or uprising, between 2000 and 2005. He was released in 2011 along with more than 1,000 other Palestinians in exchange for Gilad Shalit, an Israeli soldier Hamas had detained for five years, and transferred to Gaza. The Erez crossing is the only one between Gaza and Israel for people. Another crossing with Israel, Kerem Shalom, is used for goods. The Gaza Strip has been under an Israeli blockade for a decade. Palestinian militants in Gaza and Israel have fought three wars since 2008. Gaza's sole crossing with Egypt has also remained largely closed in recent years.